The Transparency International report, Just for Show? 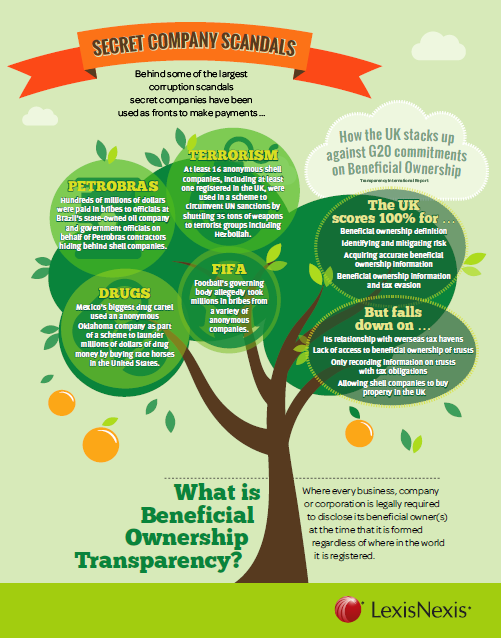 Reviewing G20 Promises on Beneficial Ownership, assesses G20 Countries efforts to stamp out the practice of disguising corruption by hiding company ownership and shifting money across international boundaries. It was at the Brisbane Summit in 2014, that the G20 leaders adopted High-Level Principles on Beneficial Ownership Transparency, describing financial transparency as a "high priority" issue. The use of bribery is systemic in international business with some of the largest scandals of recent years – including the FIFA scandal and the Petrobras bribery operation in Brazil – among the most high profile. In many cases where money has been used to corruptly pay officials, third parties or regulators as well as the purchase of luxury property around the world, secret companies have been used as fronts. Transparency International praised Britain's efforts to stamp out the practice, pointing out that amendments to the Companies Act means it is now fully compliant with four out of the ten 'G20 Principles', putting it ahead of other major economies. The organisation singled out the US and China for failing to deliver on promises to fight such corrupt practices, saying that they are among the worst offenders and calling on them to bring in legislation to stop the misuse of companies and other legal entities for corrupt purposes. While the headlines look good, the UK's domestic laws mask a rather different picture. Transparency International points out that the changes in the Companies Act relate only to businesses registered in the UK. The organisation calls the financial secrecy that still prevails in the country's Overseas Territories and Crown Dependencies "a gaping hole in the UK's armour against money laundering". Transparency International says that the UK's connections with its offshore tax havens – including the British Virgin Islands and Bermuda – makes it a prime base of operations for the corrupt. Its figures show that 75 per cent of UK properties under investigation for corruption are actually registered with offshore companies. In nearly all of these havens, information about company shareholders is not collected, making it virtually impossible to find out who is being hidden behind them. Luxury property may seem small in the great scheme of international business, but Transparency International found that 90 per cent of foreign-company registered properties in London are actually located in one of the UK's offshore havens. That makes it nearly impossible to find out how many of them are been financed using the proceeds of corruption. The organisation cites the case of Saadi Gadaffi, the son of the former Libyan dictator, who used a British Virgin Islands company to buy a £10 million property in central London using corrupt money. Transparency International is calling on British law to be changed so that prior to a purchase on a property being completed, overseas companies have to submit to the Land Registry exactly the same details as UK-registered currently do to Companies House. Whatever the UK decides to do about the financial status of its offshore territories, the report has thrown more light on the enormous international use of secret companies. In the absence of clear government guidance, enhanced due diligence, anti-corruption and bribery policies within a company represent the only viable means for a business to protect itself against possible corruption action.